The latest from Lynne and the Prakasa community. Let's celebrate diversity & practice unconditional love for one another! A rose. A child. An ocean. An ecosystem. A single thought. A full symphony. It binds people together in place and in community. A family. A small town. A great nation. A single planet. Unconditional Love is the most powerful force in the entire universe. yet it often seems unobtainable in daily life. The human heart is like a flower that opens and closes. A heart filled with unconditional love is like a lotus flower, rising out of muddy waters to offer its delicate beauty to the world. It has no idea how long it will bloom, or if anyone will even notice its presence. Still, it offers itself freely. until love can neither be given or received. What would we do in moments like these? Could we breathe, get out in nature, or lend a helping hand? Get on our mat and practice? Stop work and go have some fun? Mediate or pray? Practice acceptance for ourselves and others? Wait until the inner storm passes? Or pry the heart back open? When you've done your very best to offer unconditional love and kindness, but feel thwarted by something you may or may not understand...perhaps something deeper than a passing emotion is surfacing. And that something is what ancient yogic texts call "samskara". 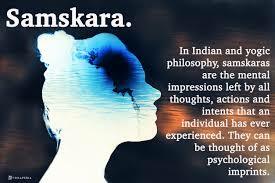 Samskaras are subconscious patterns of thought that can trigger a memory, feeling or behavior. They manifest as a tendency, an impulse, or habitual way of acting and reacting. Samskaras affect your daily life. They can trigger suffering or wellbeing. Or dredge up feelings of resentment, hate or sadness...or give uplifting feelings of love, joy, peace, contentment. A few years ago, I discovered a new modality, The Emotion Code, which I successfully used to lift a heavy cloud of grief that hung over me for a long time. In just TWO days, I felt like my usual happy self again. It was amazing!! Such relief. And that opening allowed me to feel reconnected to Source at work and at play. It was as if a floodgate opened and love poured back in. This month, we hope you find numerous ways to unblock your heart, celebrate diversity and cultivate unlimited, unconditioned love. Love is the operating system of the universe, and the power that fuels it. As a self-sustaining energy there's an inexhaustible supply waiting for you. Just open your heart and let if fill you. If you're feeling stuck (January doldrums) or are in need of uplifting - join us for one of our celebrations of the heart (read below). And if you're ready to shift any old unprocessed emotions (samsakara) that block your heart from giving and receiving unconditional love - check out my Emotion Code sessions. I work with people in-person and by phone. It's painless and the results to release both physical and emotional pain are immediate.